Between January and October 2017, the South China Morning Post reported, a total of $12.8 trillion was spent on mobile payments in China. Fintech is booming. Yu Sun, the chairman of the China Chamber of Commerce in the UK, speaking at the China Europe International Business School (CEIBS) Europe Forum in London last month, joked that if someone tries to pay for his coffee with cash in Beijing, he will be mocked. “People would ask, ‘Is that guy from the Middle Ages?’,” he said. The rise of financial technology demands collaboration, he added. And he had a message for the traditional, brick-and-mortar banking institutions we’ve all grown so used to: “banking is necessary, banks are not,” he said. CEIBS Europe Forum events typically include a day of keynote speakers, panel discussions, and networking among the school’s revered faculty, students, alumni, and those at the forefront of business in China. This year’s London stage focused on the future of financial cooperation between China and the UK. CEIBS’ dean and vice president, Yuan Ding, also speaking at the event, said his goal is for CEIBS to be the bridge between China and Europe, a platform for business and management exchange between the two regions. I’ve worked closely with China Europe International Business School (CEIBS) for a while now. What sticks out from the multiple conversations I’ve had with faculty, current students, and alumni, is the school’s mantra: China Depth, Global Breadth. This is a key hook for potential MBA applicants, but also indicates the school’s desire to be more than somewhere you go for in-depth knowledge of China. It’s somewhere you go to realize the East’s burgeoning influence around the world, and how to harness that for the good of international business. During a panel discussion at the London forum, on big data and fintech, Tong Wang, who graduated from CEIBS’ Finance MBA (FMBA) in 2017 and is the co-founder and president of fintech service company, SwiftPass Technologies, touched on Yu’s statement about the continued existence of traditional banks. 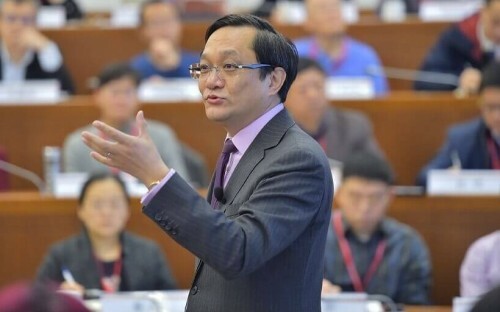 Tong is an example of how the CEIBS FMBA helps to prepare students for the future of finance. Rather than entering the sector as technical staff, a broader focus on ‘Integration of Finance & Management’, and ‘Finance Depth & Management Breadth’, delivers students into the field ready to be industry leaders. Xinge Zhao, director of China Europe International Business School’s Finance MBA, explained that the future leaders of fintech also need to acquire a specific set of soft skills to succeed—helped with the inclusion of modules on ‘Leadership and Change’, ‘Negotiation Skills’, and ‘Client Relation Management in the Digital Age’. Fintech is changing the way we approach traditional banking and, for the future of the industry, collaboration between the UK and China is key.